ConservativeTalkNow toolbar is a browser extension that claims to have the “opinions of the right all the in toolbar”. The browser plug-in is compatible with Google Chrome (available at Chrome app store), Internet Explorer and Mozilla Firefox web browsers. It might be a good tool for those who need an instant access to any media related to Conservative political views, but according to our security research specialists, you should remove ConservativeTalkNow toolbar from the PC right now, because it is nothing but bad news. If you wonder how that can be, please continue reading this description. First of all, ConservativeTalkNow toolbar can significantly slow down your browser and your internet surfing will never be what is used to. Second, it may support third party content or commercial ads that could eventually expose you to potentially corrupted websites or other unsafe content. 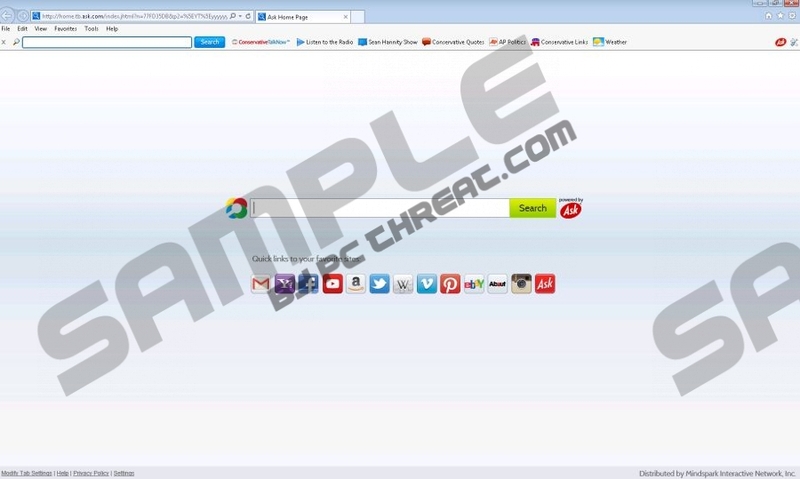 Third, the presence of ConservativeTalkNow toolbar on your computer may indicate that you have other potentially unwanted applications installed as well. ConservativeTalkNow toolbar could be available for download at conservativetalknow.com, but it does not mean that the plug-in cannot arrive bundled with freeware as well. In fact, our security specialists are strongly against ANY kind of toolbar being installed on your browser, because it can lower down your system security. ConservativeTalkNow toolbar is developed by Mindspark and this website that an elaborative support page that explains you how you can remove ConservativeTalkNow toolbar from your computer manually. It would mean that the application is very far from being a dangerous computer infection, but just like its predecessors (ButterflyField Toolbar, CitySearch Toolbar or APlusGamer Toolbar) this application is “powered by Ask”. It means that there are certain conditions related to the ConservativeTalkNow toolbar installation. To put it simply, if you go through the installation automatically without even checking what kind of functions are you are about to add to your browser, ConservativeTalkNow toolbar may also install a new search engine that changes whatever you have set as your default search provider. Ask Search will be set as the default search engine and your browser will open to home.tb.ask.com. Despite the fact that ConservativeTalkNow toolbar offers you a search provider that has an elaborate search function and a galore or shortcuts to Gmail, Yahoo!, Facebook, YouTube, Amazon, Twitter, Wikipedia and other popular websites, it is peculiar as to why ConservativeTalkNow toolbar makes use of a search engine that has been discontinued back in 2010. Needless to say, that keeping ConservativeTalkNow toolbar on your computer might eventually result in multiple adware installations and perhaps even a malware infection. Therefore, you should take your computer security seriously and remove ConservativeTalkNow toolbar right now. Please do not hesitate to leave us a comment below if you encounter any problem while trying to uninstall ConservativeTalkNow toolbar. Also, do not forget that investing in a powerful antimalware tool if your best shot at keeping your PC safe. Wait for Charm bar to appear and then select Control Panel. Go to Uninstall a program and remove ConservativeTalkNow toolbar. Select Add or remove programs and uninstall ConservativeTalkNow toolbar. Click Use default under General tab and click OK.
Press Alt+X again and go to Manage add-ons. Press the Firefox button and go to Options. Click Restore to Default under General tab and click OK.
Click Firefox button again and select Add-ons. Disable and remove ConservativeTalkNow from Extensions. Restart browser. Open Extensions and remove ConservativeTalkNow. Set a new default search engine, delete Ask Search and press Done. Quick & tested solution for ConservativeTalkNow toolbar removal.